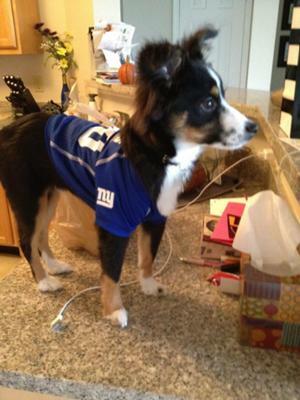 He was very happy about the Giants Superbowl win! 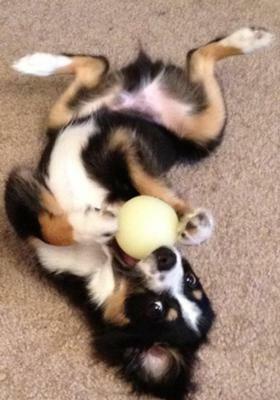 Oliver aka Ollie is my 5.5 month old mini Aussie. He is incredibly smart and the most lovable dog I have ever met! He has become quite the "celebrity" at our community's dog park! Comments for Meet Oliver, The Love Of My Life! Ham, indeed! You are so adorable. You truly brought a smile to my face. I can't wait to get my next Aussie. He looks so much like my little Brynie, who is 21 months. I had a cat named Ollie, who also looked very similar. Oliver is a cutie! He is adorable. Isn't it funny how much we love our dogs... they are funny little character's and you just look at them and smile because they are so sweet and they love you so much! I love my cousin Oliver. Wish he lived closer for daily kisses. Instead I love getting my daily picture.